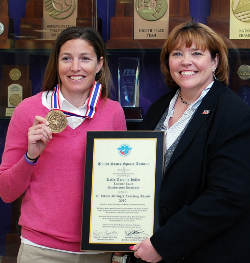 Five-time national champion lacrosse coach Kelly Amonte Hiller received the United States Sports Academy’s 2009 C. Vivian Stringer Coaching Award for outstanding women’s sports coach of the year, which was presented on the campus of Northwestern University in Evanston, Ill. by Academy alumna/Trustee and ESPN Executive Dr. Linda Moore. Hiller guided Northwestern University to a 23-0 record and fifth consecutive national championship last year. The Wildcats became just the second lacrosse program to accomplish that feat. Her career record is 147-25 going into a Friday, 30 April home game against Virginia. As a player, Hiller was the 1995 and 1996 NCAA Division I Lacrosse Player of the Year, leading Maryland to national titles in both seasons. She was a four-time All-America in lacrosse, ending her career as the school’s all-time record holder for career goals (187), assists (132) and points (319, 70 more than second place). In addition, Amonte Hiller also earned All-America accolades in soccer for the Terrapins and was named the ACC Female Athlete of the Year in 1996 for all sports. Dr. Moore, a member of the Academy’s Board of Trustees who received her master’s degree in sports management from the Academy in 1989, is the Senior Director of Business Administration for ESPN Productions, the division that produces special events like the X Games and ESPN’s original motion pictures. The C. Vivian Stringer Coaching Award is named in honor of Stringer, the only woman to take three different schools to the Women’s Final Four. She is currently the head coach at Rutgers. The award is presented to an individual coaching a female team who exhibits a high standard of propriety, imagination, and innovation as a character-builder in the tradition of great teacher-coaches.